The 29th Arab Summit which adjourned April 15, 2018, has been panned by many as having provided President Trump with a great opportunity to finalize and end the Arab-Israeli conflict. Their resolution which was the main subject on their final days all but ignored the conflicts in Syria, Iraq, Yemen, Libya, Bahrain and Sudan, giving them scant attention. Their statement released gave full attention to the Palestinian situation declaring, “We reaffirm that the Palestine Cause is the entire Arab nation’s main priority, stressing the Arab identity of occupied East Al-Quds as the capital of the State of Palestine.” Their mention of East al-Quds is a restatement of the Arab laying claim to eastern quarter of Jerusalem which includes the Old City and the Temple Mount with all the holy sites of three religions. One small item which bears great weight on their claim is the way Jordan refused to permit Jews at all times and Christians and other non-Muslims access to any of the holy areas of the Old City including the Temple Mount and the desecrations which caused the grave markers of the Mount of Olives cemetery to be strewn and broken utilized as paving stones and to construct bathrooms. This was the Jordanian idea of full and equal access for all religions which has only been realized since 1967 after Israel liberated their occupied territories from Jordan who had illegally held these areas since the 1948 war to eradicate the Jewish State which failed but still managed to steal away lands belonging to the Jewish State under the San Remo Conference and the treaties which followed. Should the world desire that the Temple Mount remain accessible to all, then the Arab Summit trap must be sidestepped and the Arabs denied their supersessionist demands. Their statement put their demands succinctly and in full claiming, “The conflict could be ended through a two-state solution that guarantees the establishment of an independent Palestinian state on the borders of July 4, 1967, with East Al-Quds as its capital.” The demand that the borders be set as they were on the day before the Arab attacks started the Six Day War where Israel liberated her formerly Arab occupied lands as well as the Sinai Peninsula, the region returned to Egypt in exchange for peace. The Arab Summit is demanded a complete reset of the situation which brought on the Arab assault to destroy Israel on July 5, 1967, something which completely ignores all previous treaties and agreements which all allowed Israel to retain lands such that Israel have a defendable border. The borders of July 4, 1967, would not allow for Israel to be defendable as it would leave Tel Aviv in direct range of the Judean Hills and a mere nine miles from Arab forces standing on the high ground overlooking most of Israeli infrastructure. Let us look first at the United Nations Security Council and their suggested solution laid out in United Nations Security Council Resolution 242, the carefully worded plan for the basis in resolving the Arab-Israeli conflict. The clause which has caused the most bafflement and confusion within the debates states, “Withdrawal of Israeli armed forces from territories occupied in the recent conflict;” which was debated to great extent with Hugh Mackintosh Foot, Baron Caradon taking the center stage in the debate on the wording of the resolution. Allow us to quote from this in depth article explaining Lord Caradon’s reasoning and purpose for his wording, “Much play has been made of the fact that we didn’t say “the” territories or “all the” territories. But that was deliberate. I myself knew very well the 1967 boundaries and if we had put in the “the” or “all the” that could only have meant that we wished to see the 1967 boundaries perpetuated in the form of a permanent frontier. This I was certainly not prepared to recommend.” Lord Caradon was specific that Israel was not to be forced to return to the same borders present on July 4, 1967, which was a major cause of the Six Day War. Many believe that the real intent of UNSC Res 242 was to have Israel return parts of the Sinai Peninsula, possibly allowing the Israel border to follow along the central mountain spine of the Sinai Peninsula and to have the Jordan River as the Israeli eastern border. Needless to point out, the Arabs have always stated this resolution claiming it actually states either, “the territories” or worse, “all the territories” while refusing to recognize the actual wording of simply “territories” allowing for the Israeli borders to be altered providing Israel with the additional territory to provide her defensible borders with the strategic depth required to do so. 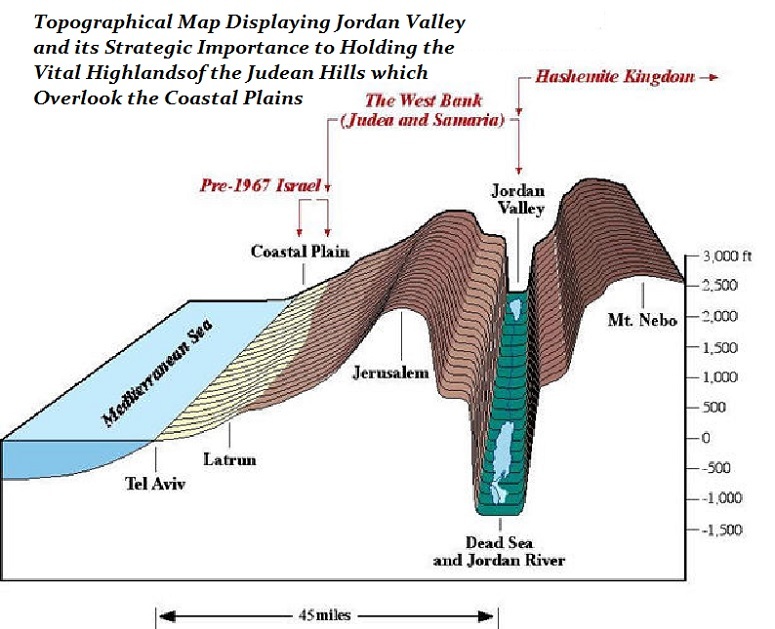 At a minimum, the vast majority of military strategists agree that for Israel to have the strategic depth and a defensible border, Israel should necessarily continue to hold the lands east of the Jordan River, the high grounds overlooking the Jordan Valley as well as the high grounds overlooking central Israel from the Judean Heights (see the cutaway showing the tactical necessities). President Trump had best familiarize himself with the tedious and specific arguments and deliberations which contributed to the formalized final draft of UNSC Res 242 before finalizing any presentation of his Deal of the Century so that he avoids falling into the Arab Summit laid trap. Allow us to now get a tad upset with the entirety of the Arab Summit declarations over three words, “could be ended,” and not would be ended or shall be ended or anything to indicate finality of the agreement in cementing a complete and total end to the Arab-Jewish Conflict, and make no pretense, that is the reality of the conflict. The Arab Summit insists on continuing their denial of the right of the Jews to self-determination. The sad part is that most of Europe also does not recognize the right of the Jews to self-determination. According to Islam, the driving force behind the lives of the Arab World, the Jews are forever Dhimmi, second-class citizens with limited rights, needing to be cared for by their betters, the believers of Islam. In Europe, this was initially driven by the Church which believed they had replaced the Jews as the Chosen People and the Jews being rejected by Hashem were now considered as followers of the devil and accursed. This belief has carried on through the Reformation to the numerous Protestant forms of Christianity and has been accepted by secularist in Europe, as it has become second nature to both Europe and the Islamic World of the MENA* states. Both Christianity and Islam have a problem with the existence of Israel in that should the Jews return to their ancient homeland and prove the prophesy that the Jewish People would be gathered again to Eretz Yisroel, then the idea that Christianity replaced Judaism and that Islam replaced both in both cases because the formers had a better and more final version of the Word of Hashem, then this becomes challenged as the original Word of Hashem of Judaism becomes reestablished. This makes Israel a threat to both faiths with an interesting exception of Christianity which has embraced the return of the Jews to their ancient homelands as one of the precursors for the coming of the Messiah. In Christianity, that return is the “Second Coming” while in Judaism it is the initial coming of the Messiah. This problem that the Arab Summit nations refuse to accept the existence of Israel and use the phrase, “could be ended,” instead of accepting any agreement as a final and acceptable end to hostility, such as terrorism, warfare, rocket attacks or Iranian nuclear attack, they leave open the intent and near certainty that all of these aggressions are to be continued. That is not peace by any definition; they are simply demanding a reset of the borders to the most advantageous set of borders for their attempts to erase Israel. This is not an offer of peace but a guarantee of ever-continuing warfare and violence in all of its numerous variations. The only peace which can be had would be to find a means of having the Palestinian Arabs in the Shomron to be returned their Jordanian citizenship and their being given enticements to move to Jordan or find a new homeland which will accept them and the granting of citizenship to the refugees by the nation where they reside as their camps are more like neighborhoods with apartments and stores surrounded by barbed wire. If the refugees were also permitted to choose where they are to reside, all of them outside of Israel being the only stipulation, even given some enticement which would likely cost less than one year’s funding of UNRWA** and the aid sent to the Palestinian Authority. This would have the advantage of finality ending this seventy-year plus struggle, but the Arabs will not accept any finality in which Israel remains and Jews have self-determination. This is, unfortunately, the position taken by many nations in the world whenever there is a vote in the United Nations. In reality, Israel is far more accepted when it comes to international relations as Israel has embassies in over one-hundred-fifty nations. Israel is a healthy nation with a thriving and growing economy and has given the world many wonderful discoveries as well as being amongst, if not the, first nation to arrive after there has been a disaster, natural or otherwise, anywhere in the world when permitted by the government, providing aid, search and rescue and often a field hospital which has functional departments for virtually any service a full sized hospital offers. Israel is a member nation in the United Nations despite being deprived of normalcy due to the Arab World and the European nations both of which do whatever they are able to prevent Israel sitting on the Security Council or to be a member, let alone chair, and of the numerous United Nations agencies. It is because of these irrational acts of belligerence against Israel often exemplified by the actions of the United Nations Agencies such as the Human Rights Commission, UNESCO, UNICEF and especially the General Assembly that Israel should fear the world accepting the phrasing, “could be ended,” as actually meaning an end to the violence and an actual peace treaty. Israel is being served by the Arab Summit a guarantee of continued violence with intent to destroy the Jewish State depriving Jews of self-determination and depriving them of life and only allowing the Jews of Israel the peace of the grave, not a peace of arms. Of course, Arab selectivity of decisions, declarations, resolutions and even wording where the words must be as they perceive them and not as they were approved, comes to the fore with their rejection of President Trump, including his recognition of Jerusalem as the Capital City of Israel, and their complete acceptance of President Obama and especially his claims that Jerusalem was actual al-Quds and that Israel must return to the July 4, 1967 lines; yet it is Israeli rejectionism that is the problem and Arab rejection of Israel is absolutely natural and completely understandable and utterly defensible, thus whatever the Arab Summit decides must be accepted as completely fair and just why Israel must be rejected as an abomination. Please excuse us if we refuse to accept Arab rejectionism concerning Israel and their demands that Jews accept their Dhimmi status. United States Ambassador to Israel David Friedman and Palestinian Authority President has recently been battling in the media with exchanges of accusations and insult. The exchanges began with Ambassador David Friedman expressing dissatisfaction and sorrow over the fact that nobody from the leadership of the Palestinian Authority had spoken forth to condemn the series of deadly terror attacks that took the lives of three Israelis over the weekend. As a simple review, please allow us to review the events from this past weekend. On Friday March 16, 2018, an Arab terrorist rammed his vehicle into four soldiers and killed two Israeli soldiers in northern Samaria, and injured two more. The terrorist was caught and was injured and hospitalized while also facing interrogation. Our murdered soldiers were Captain Ziv Deus, 21, from the Azor Regional Council, and Sergeant Netanal Kahalani, 20, from the town of Eliakim. A third Israeli was murdered in the Old City part of Jerusalem when he was repeatedly stabbed. The victim was identified as 32-year-old Adiel Kolman, a father of four from the town of Kochav Hashahar. The terrorist fled the scene but was identified as 28-year-old Abed al-Rahman Bani Fa’adal, a resident of the Palestinian Authority-controlled town of Aqraba, near Shechem [Nabulus] and was found to have entered Israel with a valid entry permit. These permits are provided to Palestinian Arabs so they are able to enter Israel and work. In this case the permit was reportedly a temporary entry permit, intended to allow Abed al-Rahman Bani Fa’adal to find work. It is more likely that the entry permit was applied for in order to carry out the attack and the terrorist lied in order to receive the permit. As long as you have no record of terror activity you are issued these permits. Fa’adal reportedly received several entry permits in the past. Abed al-Rahman Bani Fa’adal was faced at the scene of the attack and an officer who shot and killed him. 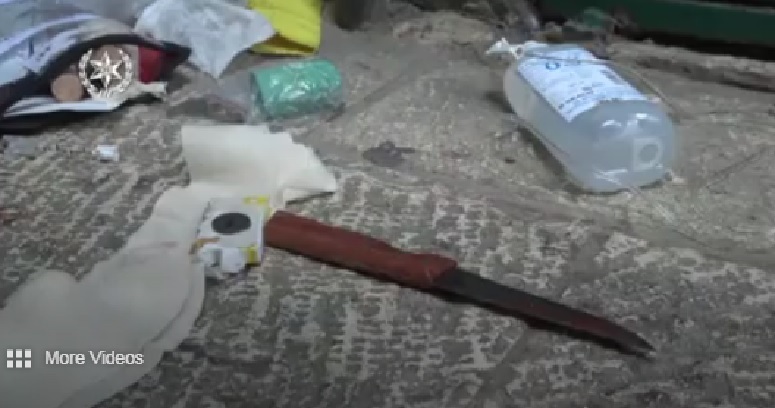 Below is a picture of the knife used to murder Adiel Kolman, the father of four from the town of Kochav Hashahar. The reason behind Ambassador David Friedman’s distress likely stems from that in the past, at the very least Mahmoud Abbas would make some statement condemning acts of terror and express (false) sympathy for the immediate family of those slain. It is realized that Abbas will continue to grant pension style funding to the terrorist in prison or the family of those slain terrorists commensurate with the number of Israelis murdered with other bonuses for special considerations. The lack of even the pretend sympathy is a further sign that all civility between the United States and the Palestinian Authority are gone and the United States will not be considered as equal to the Israelis living beyond the Green Line. These Israelis reside in Area C on lands that are legally intended for Israel to possess. The sliding scale which Yasser Arafat perfected and Mahmoud Abbas has continued has convinced the world that Israel is encroaching on lands which belonged to a nation called Palestine which was a victim in the Six Day War. The problem is there was no nation of Palestine nor has there ever been such a nation. The lands between the Green Line and the Jordan River were occupied Israeli lands by right of the San Remo Convention and numerous treaties since including Article 80 of the United Nations Charter. The occupying power was Jordan who when signing their peace treaty with Israel forfeited any claims to these lands which means there is no actual legal controversy, these lands all belong to Israel unless she recognizes another owner to whom she gifts lands such as was the case with Gaza which was turned over to the Palestinian Authority who subsequently lost it in a coup to Hamas. The rest is, as they say, history. Palestinian Authority Chairman Mahmoud Abbas responded on Monday to Ambassador David Friedman’s comments on the lack of condemnation of the weekend terror attacks. In very informal and unacceptable language, Mahmoud Abbas referred to Ambassador Friedman as a “son of a dog, settler.” This is referencing of Jews as the offspring of apes, or sometimes simply monkeys, and pigs. In Islam additionally dogs are considered an unclean animal which they are advised to avoid contact with. Thus calling Friedman the offspring of a dog, he avoided using the usual denotation for somebody who is Jewish using Dog instead of Ape or Pig. Abbas was still insulting the American Ambassador and went further to call him a settler and his family to be settlers in his Ramallah speech where Abbas said, “The United States legitimizes settlements. That’s what American officials do, and at their head, in Tel Aviv, is David Friedman. He said, ‘They’re building on their own land.’ The son of a dog, they’re building on their own land? He himself is a settler, and his entire family are settlers.” This name calling and using an unclean animal could easily make them a legitimate target for a terror attack in the minds of Palestinians. Some terrorist may go so far as to decide that he will strike this “dog settler” and rid Abbas of this thing which is obviously unclean and residing on stolen lands. The American Ambassador’s apartment is in West Jerusalem, not in East Jerusalem, which does not matter to Mahmoud Abbas as he considers Tel Aviv residents to be Jews living on occupied Palestinian Lands. Mahmoud Abbas and the majority, if not all, of the Palestinian Authority, the PLO and Fatah Party leadership view all of Israel as rightfully theirs. This is what they mean when they refer to the seventy years of occupation as Mahmoud Abbas consistently states at the United Nations without even a peep of opposition. The video below is from the official Palestinian Authority television broadcast station from March 11, 2016, just over two year ago. In this video near the forty-second mark is where Abbas refers to what he called their occupation for 67 or 68 years which takes us back to 1948 when Israel was established. When Abbas states he wants to go back to before there were lines, he desires a return to Ottoman Rule where the Muslims ruled all of the lands from Turkey. Jerusalem was home to a majority Jewish population and Jews were permitted to reside anywhere in Jerusalem. Abbas has even denoted that he desires to return to May 13, 1948, one day before Israel declared her independent existence and when six Arab armies supported by a number of militias all attacked Israel and when she lost Gaza to Egypt and Judea and Samaria to Jordan. But Abbas simply desires to erase Israel from any lands and existence. Needless to say, American Ambassador Friedman did not take the slight from Abbas well. As a matter of fact, he made it the central theme of his opening remarks to the Sixth Global Forum for Combating Antisemitism (see video below). Ambassador Friedman stated to the Global Forum for Combating Anti-Semitism, “Three Jews were killed in cold blood by the Palestinian terrorists, and the reaction from the Palestinian Authority was deafening. No condemnation whatsoever. I pointed that out, without further adjectives, without further commentary. Abu Mazen (Abbas) chose to respond. … His response was to refer to me as the ‘son of a dog.’ Anti-Semitism or political discourse? Not for me to judge. I’ll leave that all up to you.” One can easily assume how the attendees at the Sixth Global Forum for Combating Antisemitism would react to this dangerous game and name-calling. 1) Hundreds of people crowded in a cemetery, sometimes an improvised one. 2) The victims, all young Israelis, civilians, fathers, husbands. 3) Killed by Palestinian Arab terrorists just because they were Jews. 5) Young wives and mothers in mourning, small communities devastated by the violent death shattering the sense of security. 6) No condemnation by Palestinian “peace partners”. 7) Faint, inaudible voices from Europe. Giulio Meotti struck the vital chord in this saga, the reactions in the Western World and the reason they are so jaded. They are shown scenes of people starving or standing before a half destroyed building weeping for their loss. Every one of these stories tells of Palestinian troubles and hardships. You will see a Palestinian mother whose son, a terrorist, was killed while perpetrating a terror attack aboard a Jerusalem bus in October of 2015 and said she hoped her other sons would follow in his footsteps, and, with knife in hand, announced her intention to carry out her own attack against Israelis. The next video is from July 22, 2009, and depicts a mother before and after her son commits an act of terrorism seeking to be killed by Israeli troops. One might ask what gain is there in being killed by IDF troops or police while you are in an act of terror murdering innocents who are usually not armed. The reason is obvious, it brings honor to your family and guarantees them a far better wage for their son dead than he could make while living. Many of the terrorists when captured claim that there are no decent jobs even with the Palestinian Authority government and the stipend granted the family of a martyr is far greater than even a good job would pay in their society. They give their lives so their family can have a better life. If they commit a sufficiently violent crime killing many Israelis leading to their house, their family’s house, being demolished, the Palestinian authority builds them a new house. So it could be two benefits, a new house and a high stipend salary earned each month by their now dead son. She also states her wish to have one-hundred sons to sacrifice to Allah. What religion do you know where you sacrifice your children to your deity? Think about this religion existing in our modern world where sacrificing your children to your deity, to your god. And this idea of sacrificing children to Allah is not new and exists throughout much of Islamic culture and lands. An entire webpage is dedicated to such exuberance from parents of martyrs, for any wishing to see more. We do not even wish to think about this any further; it sickens us. The terror war in Israel is unfortunately continuing at a higher than acceptable pace. Hamas is still taking all the cement and bracing lumber to make their tunnels into Israel and Israel continues to destroy them as they are detected. 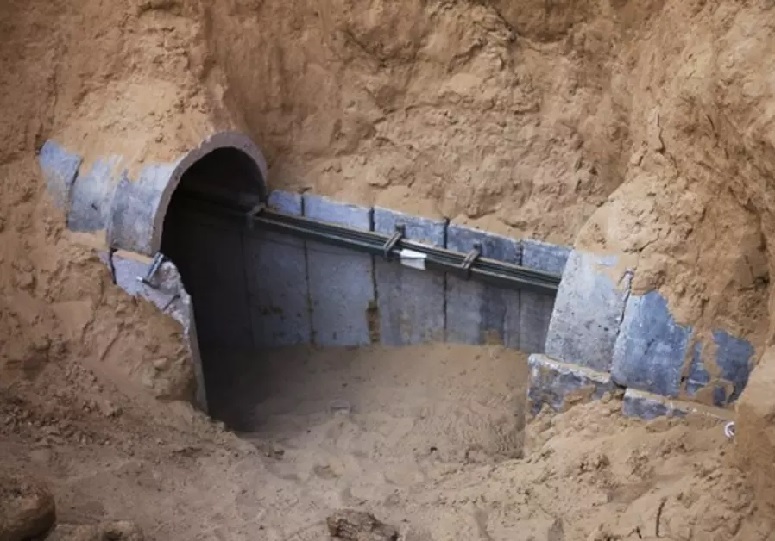 Hamas has invested anywhere from two to five million Euros on each tunnel and Israel destroys a tunnel almost every week and two on a good week. That is a lot of time and effort and steals from the people in Gaza who also need these supplies to rebuild their homes and lives. Below is a picture of one of the discovered tunnels which was subsequently destroyed. Hamas could build apartment buildings and it is estimated that the cost and supplies utilized in building one tunnel which Israel finds and destroys could have built three schools or five clinics or almost two hospitals. These estimates do not include the entire network of underground bunkers and interconnecting tunnel structures which are underneath Gaza City, Rafah, and Khan Yunis as well as the refugee camp. Why there is a refugee camp in Gaza is beyond our understanding, as there is little if any difference between the people in the camp and those outside the camp except those inside the camp eat even if they have no job, those outside the camp do not have that privilege. These UNRWA camps have found a means of destroying any possibility for civility between them and those outside their camps throughout the Arab world. Much of this has to do with the refugees selling off items, which UNRWA replaces freely, making a tidy profit off their fellow Arabs. Additionally, the refugees receive a stipend so as to provide them some dignity despite not having steady jobs as these camps often are closed holding the refugees within as in the past when they were permitted free movement a fairly large number fled to start life over and live a normal life. Still, others have adopted the life of living off the largess gifted them by UNRWA and are in their third or fourth generation exploiting the charity of the world. President Trump decided the United States was not going to further invest in this wasteful system and ended United States UNRWA aid monies. We should end on that one good sliver of hope. President Trump has correctly placed Fatah, the PLO, Palestinian Authority, Palestinian Arabs, UNRWA and Mahmoud Abbas into one large single basket to be treated as a single entity. There are many advantages to this and no down side. Grouping these and basically labelling them Mahmoud Abbas links them all to their central mouthpiece and the person who controls the entirety of the Palestinian Arab acts, political, terrorist, monetarily, constructs, terror rewards, education, elections (or lack thereof) and decisions of any nature. This means that striking at any one of them is a means of striking Abbas or rewarding Abbas. The one with the slightest difference is UNWRA as it also strikes at the United Nations which often acts as another supporter of all things Mahmoud Abbas. President Trump and Mahmoud Abbas have been engaged in testosterone spitting contest trying to establish which one is the dominant one in their relations. The history of American and Palestinian Arab relationship has an interesting record, as most people would assume that the United States would be the dominant player. They would be very wrong in this assumption. Since the very beginning, the Palestinian Arabs have dictated the relationship constantly pushing the United States and each successive President to push the Israelis to constantly make concessions while receiving nothing in return. The relations have been excessively one-sided, especially since the signing of the Oslo Accords. Time and time again the Israelis were cajoled, threatened and even faced an embargo forcing them to give the Palestinian Arabs control over more lands, complete control over Gaza, Hevron, Bethlehem etcetera. This relationship has been utilized and exploited making Israel appear weak and unable to press their side and story over the claims made by the Palestinian Arabs to such an extent that now the world has taken the Palestinian Arab side against Israel fearing no retributions or dangers from these acts. Under President Trump that has changed. Despite President Trump reading Mahmoud Abbas the riot act, Mahmoud Abbas refuses to believe that he can lose from ignoring the American President. Abbas is so used to getting his way if he simply presses forward and refuses to back down that he still thinks that President Trump can be forced into compliance with the Palestinian Arab politics. Since the Six Day War the Arabs, including specifically the Palestinian Arabs, have watched Israel return the entirety of the Sinai Peninsula to Egypt for a piece of paper which was proven worthless during the time the Muslim Brotherhood and President Morsi were in office in Cairo and have not exactly become worth much more with President Sisi who has kept a very cold peace. The peace treaty with Jordan has resulted in little change in relations between the two nations with Jordanian media still printing much hateful, anti-Semitic, and anti-Israel articles and editorials. Israel was pressured by President Obama into apologizing to Turkey over the Mavi Marmara and paying the families of the terrorists who were killed in their attack attempting to break the Gaza embargo. Under George W. Bush Israel removed thousands of Jewish families from Gaza and turned the entirety over to the Palestinian authority under their word they would be nice and build a working relationship. They lied and never acted any differently and then lost in a coup that almost appeared to be a simple handover of Gaza to Hamas and Islamic Jihad resulting in three wars resulting from rocket assaults on Israeli civilians. These are just some examples of cases where the United States with President Willian Jefferson Clinton, President George W. Bush and President Barack Hussein Obama and their combined history of forcing Israel to surrender over and over again to the demands from Mahmoud Abbas and Yasser Arafat before him. Mahmoud Abbas has been rewarded for his stubborn refusal to negotiate unless given huge rewards just to sit down once with the Israeli leadership and then refusing to actually negotiate. He has pretty much assumed that a single camera opportunity each year or so which has satisfied every former President. Abbas expected President Trump to be no different from his predecessors and has seen some Presidents who initially supported Israel but sooner or later, they would pay the piper and cave to Palestinian Arab demands and forcing Israel to make concessions. Abbas is acting as if he has to prance for the first year and possibly two while President Trump enforces his Israel backing credibility before then turning and forcing Israel into making some serious concessions. Abbas is simply grinning and bearing the abuse expecting great rewards in the future. That brings everything down to a simple question, will Trump resort to pressuring Israel into making concessions in order to be able to have at least one meeting between Prime Minister Netanyahu and President Abbas in front of the White House or will he continue to try and force Abbas without resorting to pressuring Israel, like every President before. But perhaps there is some miscalculation by Mahmoud Abbas and President Trump actually means he stands with Israel. Even if President Trump and his team actually do stand with Israel, there is another piece to the puzzle which could be a wildcard, the State Department. The State Department has been antagonistic to Israel since its founding where they advised President Truman not to recognize the Jewish State. There have been many instances through the history of Israel where the State Department has been less than, how can we put this, helpful on affairs with Israel. It was the State Department and Secretary of State Condoleezza Rice who pressed for the Gaza evacuation and gifting to the Palestinians which led to Hamas taking control and caused a number of wars between Israel and the Arab terror groups in Gaza since the turnover. There is still a possibility that the State Department might pressure President Trump sufficiently over time until he finally pressures Israel under the State Department pressing that Israel has been unhelpful. The current signs and indications are that President Trump believes, unlike previous administrations, that Israel has sacrificed far too much and should not be forced to sacrifice further. 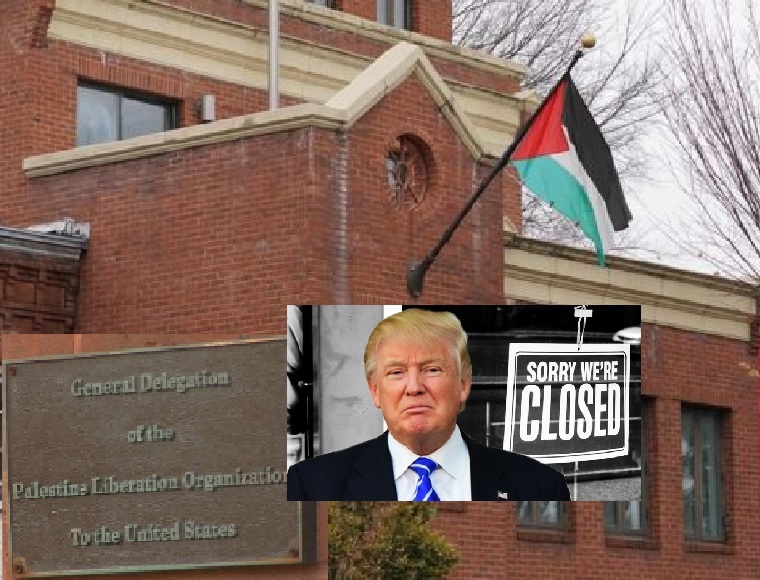 There have been indications that President Trump may be on the verge of closing the PLO offices in Washington D.C. This would be unprecedented but still might not be sufficient to force Mahmoud Abbas to change his attitudes. Abbas is so set in his ways and is not an honest partner and does not care what President Trump does because he also knows that at the longest period of eight years he will be done with President Trump if not sooner. Abbas does not even care if Vice President Pence were to follow President Trump and also serve a full two terms, he will not change his attitudes. Even should Abbas be replaced as the leader of the Palestinian Arabs, it will not change their attitudes or demands because the Palestinian Arabs themselves have been promised the end of Israel and will accept no less. The Palestinian Arab leadership, no matter who they may turn out to be after Abbas, will not accept anything less than Israel destroyed by the rest of the world including the United States in concert with the United Nations, European Union, European Nations, Arab world and every other nations on Earth and some also desire the Jews of the world all murdered as well. Of all the assumptions possibly made by Mahmoud Abbas, the most frightening is that all he need do is wait for the next favorable administration. The Palestinians are fully aware that if they are simply patient and refuse to meet Israel any percentage of the way, then eventually the world, including the United States, will sooner or later lean on Israel and force them to give the Arabs whatever they demand and by repeating this, they will destroy Israel in stages. The reality that this is probably an assumption that will prove true long before it may ever prove false, is sufficient reason for President Trump to be wise not to allow the Palestinian Arab threat to Israel to persist past his first term. One need remember that every President since Lyndon Banes Johnson has claimed to be the best friend which Israel has ever had in the White House, even including President Obama. We remember when President Obama was initially elected and a friend inquired what to expect concerning all things and we told him to expect President Carter on steroids and that this would be no truer than things concerning the Middle East. This friend had doubts that President Obama could outdo President Carter when it came to making trouble for Israel, especially all that President Carter has done since leaving the White House. We would hate to have to say this concerning a new President except putting in President Obama instead of President Carter, but there are those who would be worthy of such a warning. Whatever the case, President Trump should be warned not to allow any future President to be handed a Middle East where Israel is unfinished business, and that is the reality, the absolute reality.